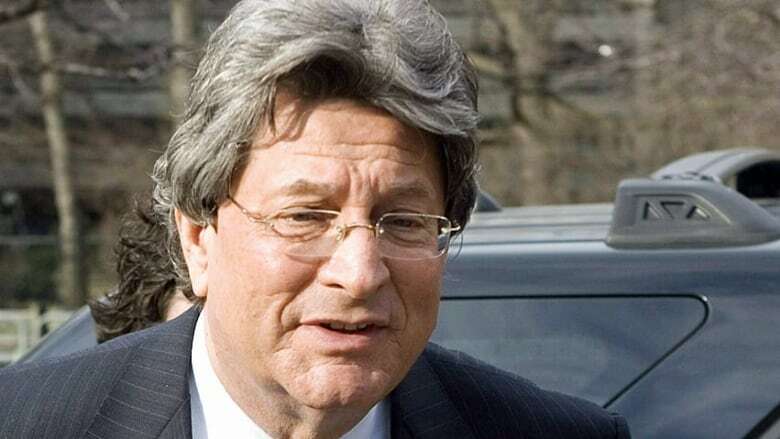 Lawyers for Garth Drabinsky were in Federal Court Tuesday fighting on behalf of the disgraced theatre mogul to reclaim the Order of Canada he lost while serving his prison sentence for fraud. Garth Dabrinsky is asking a federal court to declare the decision of the Order of Canada advisory council unlawful. the Order of Canada he lost while serving his prison sentence for fraud. Drabinsky -- who is on day parole in Toronto but wasn't at the hearing -- is asking the court to declare the decision of the Order of Canada advisory council unlawful. He wants the court to order the council to consider more submissions from him about why he should get to keep the honour, received in 1995, now that he is out of prison and able to prepare them. His lawyer argued that the way in which Drabinsky was stripped of his Order involved a "denial of natural justice." "It is clear the advisory council did not do what it was required to do," said John Koch. Koch said it's not apparent if the advisory council adequately reported on its findings when recommending to the Governor General that Drabinsky be stripped of the order. Koch also suggested the Governor General was "misadvised" that the council had considered all evidence in the case, saying the body didn't highlight the fact that Drabinsky wasn't given the opportunity to make in-person submissions. "The governor general had the option to consult again and the governor general was deprived of that opportunity by the failure to set out those findings," Koch argued. A lawyer for the council, however, has countered that the advisory council's process was fair and involved ample consideration of Drabinsky's arguments against his Order of Canada being revoked. "It is clear there was no misrepresentation, no deception," said Christine Mohr. "The advisory council and the Governor General take these matters very seriously." "Mr. Drabinsky submitted a large volume of material, which covered a broad range of topics which was considered by the council and the Governor General." Drabinsky and business partner Myron Gottlieb were convicted in 2009 for a book-cooking scheme that ultimately resulted in the demise of Livent Inc., the company behind such hits as Phantom of the Opera and Ragtime. The council wrote to Drabinsky last summer saying they were considering removing him from the order and asked him for submissions, but he said since he was still incarcerated he couldn't access necessary documents. In its written arguments filed before the hearing, the advisory council argued that the court has no power to review decisions about granting honours. "The assessment of ongoing merit and considerations as to how best to maintain the esteem of the order are highly subjective matters involving social, moral and political concerns which have no bearing on individual legal rights and interests," Mohr wrote for the advisory council. The advisory council also has no decision-making power, it argued. It makes recommendations to the governor general, who makes the final calls. The council's review of Drabinsky's order was triggered by a letter from a member of the public, who wrote that if the Livent fraud isn't behaviour that undermines the order then "I really don't know what is." The council argued it had no legal duty to give Drabinsky a time extension beyond the 30 days it granted. "Essentially he argued that the advisory council was required to wait seven to 10 months until his release from prison, before it could proceed with its inquiry," Mohr told the court. "There is no basis for you to find that Mr. Drabinsky had a legitimate expectation to the seven to 10 month extension." Drabinsky did not detail what information he wasn't able to access while in Beaver Creek Institution in Gravenhurst, Ont., and the submissions that he did make to the council already detailed his contributions to Canadian arts, the council argued. "The relevant facts are not each and every fact the individual could bring...the relevant facts are the facts the council determined were relevant," said Mohr. Drabinsky sent a 17-page letter and "extensive documentation," the council writes, including a copy of his autobiography, "Closer to the Sun." "It cannot be disputed that the economic impact to Canada of my entrepreneurial and creative activities was in the billions of dollars and the cultural impact was unparalleled in the history of this country," he wrote. "For over forty years I have never quit on Canada...Act I of my business career was primarily focused on the motion picture production and cinema phase of my life. Act II was primarily devoted to live theatre. Act III hopefully will commence this fall. There has never been an intermission." It is not an award for good behaviour, Drabinsky said, noting that disgraced Olympian Ben Johnson is still a member of the Order of Canada. A criminal conviction does not mean automatic removal from the order. The justice of peace who heard the case on Tuesday said he would examine all arguments before making a decision. Drabinsky was released to a Toronto halfway house last year after serving part of his five-year sentence for fraud. Ontario's law society is also taking steps against Drabinsky that could result in him losing his licence. The Ontario Securities Commission is also reopening its regulatory case against Drabinsky, Gottlieb and a third Livent executive, Gordon Eckstein.